Here is my brave, courageous moment for the day. Anything I put out there that I have made causes me to worry. Today I panicked a little bit, but thanks to my amazing sister-in-law from Bethany Marie Designs who talked me off my wall of worry, I was able to get these little/ big guys in the shop. Check them out. 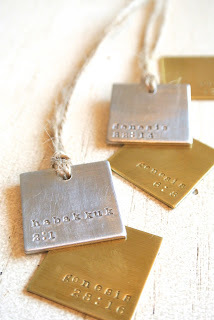 (25 hand stamped ornaments, choice of all gold (brass), all silver (aluminum), or a mix of the two).